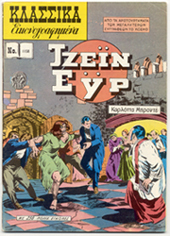 version of JE – in modern Greek. This exhibition marks the 150th anniversary of the death of Charlotte Brontë (1816-55), and it celebrates the enduring popularity of her most famous novel, Jane Eyre. A favorite with Victorian readers (and of Queen Victoria herself), JE became a staple of the school curriculum; today it remains a cornerstone of the English literary canon. “Eyre Apparent” follows the novel from the mid-c19 to the present, from the printed word to the household word in the contexts of bookshop, library, stage, screen, classroom, and playroom. From series books to comic books, from thimbles to cigarette cards, the materials on display reveal how shifting cultural contexts have affected and continue to shape the book’s meaning, and how JE continues to influence our present-day imaginations. Charlotte Brontë's rise to fame began with a spectacular failure: she and her sisters Anne and Emily self-published a volume of Poems in 1846 that is said to have sold only two copies. 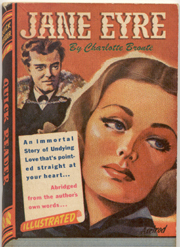 A year later, Charlotte Brontë (using the pseudonym of Currer Bell) submitted a novel, The Professor, to various London publishers. The reader for Smith, Elder, & Co. liked her work, but asked for a longer narrative to conform to the standard three-volume format in which most new fiction then appeared. Brontë promptly sent in the manuscript for JE, which Smith, Elder published in October 1847. Like other English novels of its time, JE retailed at the artificially high price of £1 11s 6d [about £1.58] – then the equivalent of a week's wages for a skilled laborer. Most Victorian readers of new fiction did not purchase their novels; instead, they subscribed to circulating libraries for an annual fee that was usually less than the cost of a single new novel. Because their subscription gave them borrowing rights to only a single volume at a time, readers had to make three trips to the library to read an entire three-decker novel. An immediate success, JE went through numerous editions, translations, and theatrical adaptations in Europe and America in the second half of the c19. By 1901, the novel’s canonical status was confirmed by its presence as the first volume issued in the World’s Classics series (“only the world’s literary masterpieces have been, and will be, included in the series,” its publishers announced). JE has been through hundreds of c20 printings; there have been 29 film versions and more than 50 stage and musical adaptations. Today, JE is one of four c19 novels offered as part of a two-volume version of the ubiquitous Norton Anthology of English Literature: instructors can choose to have their students purchase the Norton Anthology bundled with JE, Hard Times, Pride and Prejudice, or with Wuthering Heights. 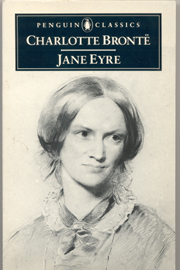 A recent search conducted in Books in Print gives a higher total for books titled “Jane Eyre” than any other novel with the exception of Mary Shelley’s Frankenstein. The earliest editions of JE were unillustrated. Smith, Elder did not publish the first illustrated edition until 1872, with images that apply as easily to Brontë’s own life (as popularized by Mrs Gaskell’s biography) as to her novel. Numerous illustrated editions have appeared since. Each imposes the perspective and assumptions of its artist and its own time on the reader, sometimes with wonderfully absurd results. The collage on the front panel of this brochure contains details from the covers of 21 different editions of JE published between 1910 and 2004. The images on these covers include a Victorian painting of a governess, a pre-Raphaelite maiden, a Gibson girl clone, and a 1940s movie star. JE has seen a carnival-like array of abridgements, adaptations, retellings, and other derivatives. 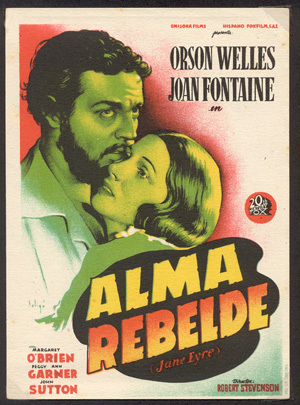 Notable spin-offs include Wide Sargasso Sea, The Eyre Affair, Mrs Rochester, Jane Rochester, and Jane Eyre's Daughter. Unusual treatments include Jenna Starborn, a sci-fi novel which casts Jane as a space-traveling nuclear technician, and Disciplining Jane, an SM novella which turns Lowood into a school the Marquis de Sade might have supported. JE has inspired major works of literary criticism, such as Sandra M. Gilbert and Susan Gubar’s groundbreaking feminist study, The Madwoman in the Attic (1979). JE has been treated in more than two dozen different study guides, including no fewer than four different editions of the CliffsNotes. Students unwilling to read even crib notes can listen to a study guide – “because books are long and life is short,” as the blurb on the audiotape box explains. penny to show the scale of the book. The Rare Book School (RBS) Jane Eyre collection got its start when director Terry Belanger acquired a copy of Thomas Bewick’s British Birds containing the wood engravings described in JE’s first chapter. A full appreciation of the impact these images have on Jane is not possible apart from an understanding of the scarcity of printed images in provincial early c19 England, and of the popularity of Bewick’s book illustrations. For Belanger, these prints formed a powerful classroom teaching tool for demonstrating the significance of bibliographical context in understanding a literary narrative. He began to acquire editions of JE with a view toward showing how rarely the Bewick illustrations are reproduced in them – and a collection was born. helps to set the novel within the gothic tradition. In 2001, Belanger stumbled across a Newsweek article describing four recent editions of JE, leading him to wonder how many editions were currently in print. Subsequent conversations with then-RBS Curator of Collections John Buchtel led to a scouring of Books in Print, Amazon.com, and eBay. In less than a year, the collection had mushroomed, and it began to be used heavily as a microcosm of industrial-era publishing and marketing practices in several of the five-day courses in RBS’s independent institute for the history of books and printing. The collection has also supported several University of Virginia (UVa) courses, providing a series of case studies of the ways the physical forms in which books appear affect their meaning. One of this exhibition’s goals is to demonstrate how texts are inevitably enmeshed within a variety of contexts, and that studying a novel involves investigating cultural settings that stretch far into the past and continue to be reinvented in the present. The show’s curators hope the materials presented here will inspire teachers, students, readers and collectors alike to approach texts with an eye toward their multifarious physical manifestations. “Eyre Apparent” was curated by John Buchtel (Curator of Rare Books, Sheridan Libraries, The Johns Hopkins University) and Barbara Heritage (Curator of Collections at RBS). The curators wish to thank Terry Belanger, Carsten Clark, William Ingram, the staff of UVa's Albert and Shirley Small Special Collections Library, Karen Chase, Daniel Kinney, and the many RBS faculty and students who have seen and commented on the RBS JE collection.